The Palestinian Authority continues to defy and mock its donors. Although donors have repeatedly condemned the PA's policy of naming schools and community centers after terrorists and murderers and have refused to fund them, the PA continues to name schools after terrorists. Occasionally the PA pretends to comply with donor demands to stop terror glorification. This is one of those cases. 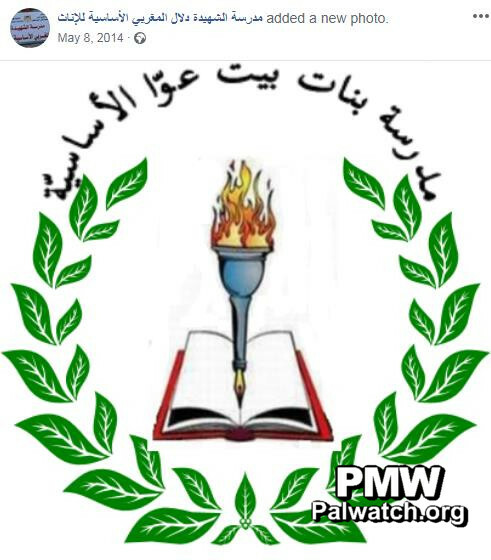 Sept. 27, 2017: PMW exposes that PA named a Belgium-funded school after a terrorist murderer: "The Martyr Dalal Mughrabi Elementary School"
July 31, 2018: PMW notifies Belgium that the school is still named "The Martyr Dalal Mughrabi Elementary School"
Two weeks later, Aug. 23, 2018: PA removes terrorist's name from school and renames it: "The Belgian School"
"A spokesperson for the Belgian Foreign Ministry told The Algemeiner in response that the country stood by its previously articulated policy regarding support to schools in the Palestinian territories, which 'unequivocally condemns the glorification of terrorist attacks.' He affirmed that the decision to suspend two Palestinian school construction projects in the West Bank 'remains in effect until further notice.'" However, the PA leaders, who for years have refused donor demands to stop terror glorification, decided that since they were being coerced by the Belgian government, they would mock Belgium instead. On the very same day that they changed the school name to "The Belgian School," they transferred the name "Dalal Mughrabi" to a different school in the very same neighborhood. And to add insult to injury, the PA decided to build an additional school, and also name it after terrorist Mughrabi! "The Dalal Mughrabi School's name was changed to The Belgian School - Tala'ei Al-Janoub in honor of the Belgium government that built it. 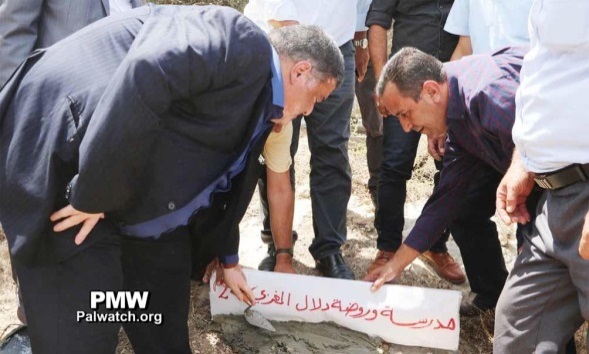 The Education Directorate transferred the name [of the Dalal Mughrabi School] to the Beit Awwa Elementary School for Girls and it is building a new school named after Dalal, which includes a kindergarten." PMW has verified the transfer of the Dalal Mughrabi name to the other school in the same neighborhood. The pictures below show the Facebook profile pictures of the school with its original name and with its new name. On the left, the school has the name Beit Awwa Elementary School for Girls. On the right, it has the name The Martyr Dalal Mughrabi Elementary School. 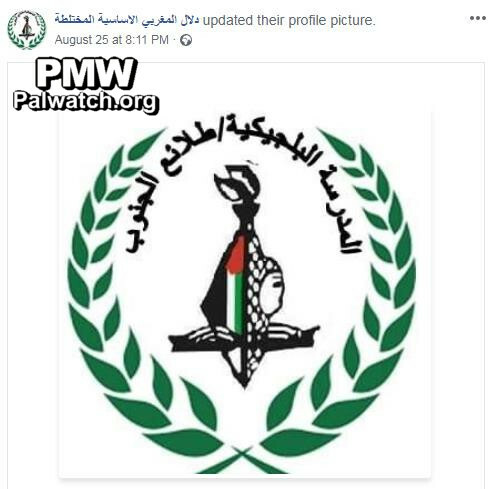 This picture was posted on Aug. 23, 2018, right after the PA transferred the terrorist's name from the Belgium-funded school to this school. Laying cornerstone of the new school. Text on cornerstone: "The Second Dalal Mughrabi School and Kindergarten"
"The principal of The [Belgian] School - Tala'ei, Badria Al-Sweiti, emphasized that Beit Awwa did not lose the name Dalal Mughrabi, but rather the name was transferred to The Beit Awwa Elementary School for Girls. 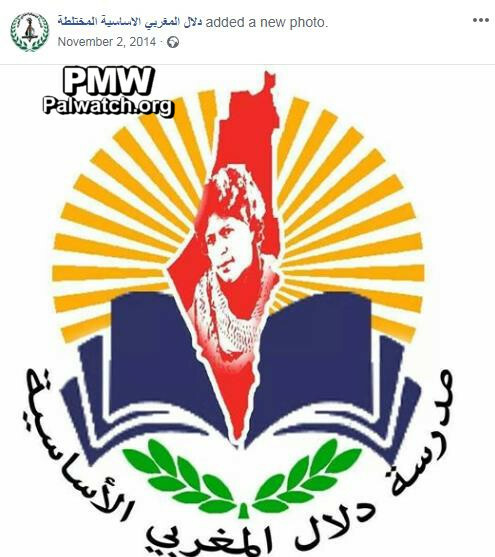 She added that the [PA] government has laid the cornerstone for a second school named after Dalal in Beit Awwa (i.e., The Second Dalal Mughrabi Republic School)." 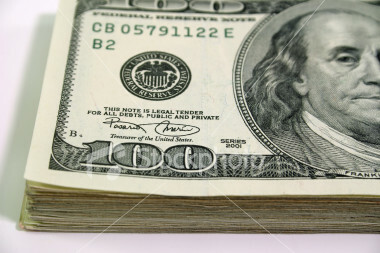 Additionally, the PA has announced that the new school "will be funded from the state coffers." This is supposed to prevent donors from complaining that their money is funding schools named after terrorist murderers. 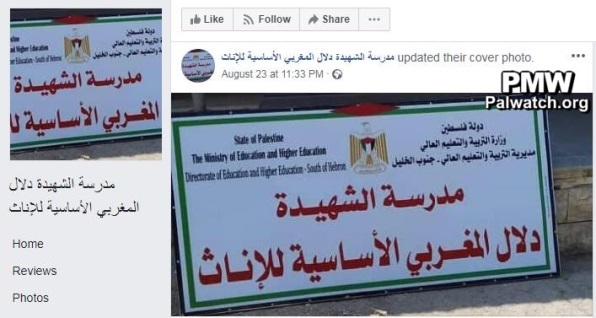 However the real question is: Will Belgium and others who fund the PA Ministry of Education and the building of PA schools, such as Britain and the EU, as well as other countries who have condemned PA terror glorification, ignore this manipulation and mockery by the PA? In another act of defiance of its donor country Belgium, the PA Ministry of Education has created a new logo for The Belgian School that teaches children another PA educational message that European countries likewise reject. Will Belgium agree that the school which it funded and now bears its name "The Belgian School" now has a logo with the message to Palestinian children to envision a future world without Israel? These are critical questions that Belgium must actively respond to. Since the establishment of the PA, donor countries have been irresponsible in their lack of supervision of what the PA has done with their money. The PA has used donor money to pay salaries to terrorists, produce children's programming on TV encouraging children to seek martyrdom, and build a Ministry of Education that poisons the minds of Palestinian children in numerous ways, among them, naming dozens of schools after terrorists and Nazi collaborators. The following are examples of Norway, Denmark, the UN,Holland, Sweden, and Switzerland condemning the PA for naming education and cultural buildings that they had funded after terrorists.